The centre, which will function as a new federal unit from December 1, is tasked with monitoring the Russian and global security situation. After a presidential decree was issued, the Russian Ministry of Defence spent over a year establishing the National Defence Management Centre, a secret complex near Moscow that will monitor Russian and global military and security developments. In the complex, which will function as a new federal unit from December 1, all defence-related information flows will be narrowed down to a single channel, the head of the Main Operations Directorate of the General Staff of the Armed Forces of the Russian Federation Andrey Kartapolov told Rossiyskaya Gazeta in an interview. This would enable real-time tracking of all military movement in Russia and global defence developments. According to the Ministry of Defence, the new structure includes the Control Centre of the Strategic Nuclear Forces, the Centre of Command, and the Centre of Control of the daily routine of the Armed Forces. In addition to the Ministry of Defence, the National Control Centre will be managed by the Emergencies Ministry and Federal Security Service’s Border Guard Service. Each ministry and agency has its own section in the security system of the country, Kartopolov said. The centre is also expected to monitor and coordinate in real time all phases of manufacturing and repair of military equipment, starting with signing a state contract and launching production, to delivering a particular weapon sample to a particular military unit. At the same time the centre's specialists will monitor everything concerning the preparation of sites for the storage of weapons and equipment, recruiting and training of combat crews and the crews to operate them, Kartopolov said. The centre will operate a state of the art hardware and software system that will allow it to handle crises not only within domestic borders, but anywhere in the world. The centre is fully protected against a nuclear attack as well. “I would like to remind you that this factor is always being considered in the construction of important sites,” Kartopolov said. During the Vostok-2014 exercises, the National Defence Centre conducted round the clock monitoring of the events in the east of the country. 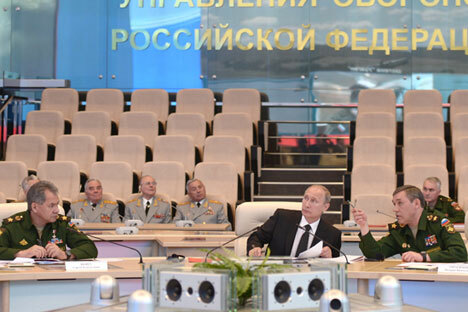 The exercise process was monitored in real time using GLONASS, other systems and the reports of commanders. In addition, the National Centre obtained an unbiased picture of how the other ministries and agencies work with the exercise script, while the experts of the centre were communicating control signals to military units and compounds. This is an abridged version of an article, first published by Rossiyskaya Gazeta.